How many things can you bake with a muffin tin? This month I will be revealing some wonderful muffin tin recipes, both sweet and savoury, that are perfect for kicking off the fall baking season. 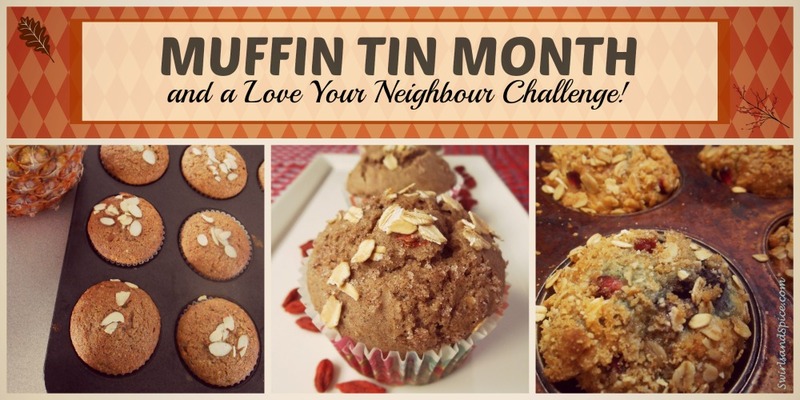 And since muffins are great for sharing, I invite you to join me in a unique baking challenge! All month long I will be adding recipes to a new Muffin Tin Mania board on Pinterest. And you can be part of it! Just share a link to a muffin tin recipe in the comments. There is a limit of one recipe per person, and it should be something that you have baked before. The recipe can be your own, or someone else’s recipe that you love! Now for the challenge. Help us bake 100 muffins! For every pin of the Muffin Tin Mania board, my children and I will bake a home-baked muffin to give away, up to 100 muffins. We’ll choose a few favourite recipes and deliver muffins to neighbours and also to families that we know who are caring for foster children. There are so many possibilities with this idea. I invite you to take the challenge and run with it. Below are a few specific ways you could join in this challenge. As mentioned before, simply leave a link to a muffin tin recipe you have baked in the comments. The more people who add recipes, the more muffins we will bake to share! Each recipe that fits the theme will be added to the Muffin Tin Mania board on Pinterest. Invite others to join us here and add a recipe too! Bake some muffins (whatever number you wish–even a half dozen is fine!). Give them away to neighbors or anyone that you would like to reach out to in kindness. I am excited about intentionally sharing the baking that I enjoy with others in my community. When a friend or neighbour has showed up at my door with homemade food, it brightened an otherwise difficult day; I would like to follow their example of reaching out. So let’s get baking and sharing! Thanks for jumping right in, Shauna. Your muffins look scrumptious! This is so amazing of you and your children! Although I bake a lot of muffins and cupcakes, I wanted to share something a little different with you! Here are my bacon and egg breakfast cups. 🙂 Hope you like them! Savoury is terrific too! I am a huge breakfast fan! Wonderful! I’m glad to hear you will be sharing with your neighbour too! 🙂 She’ll love them, I’m sure. Here is my 7 year old son’s absolute favorite recipe and he can make them with a little help. Love this concept! These Turkey Meatloaf Muffins are protein-packed! Top with spaghetti sauce or ketchup, Parmesan or breadcrumbs. It’s on the board! Thanks for sharing! What a great idea to share some with your local firefighters! Pinned and tweeted! Thanks so much! Thanks for sharing your lovely recipe! I’ve added your muffins to the board and tweeted about it! Your wonderful recipe has been added! Thanks so much! Those rolls look SO delightful! I’ve pinned and tweeted them! Thanks for sharing! Here is the link to the muffin tin scalloped potatoes you asked me to share. I have a couple of other muffin tin recipes I’d like to share as well! Thanks!! Thanks! I pinned this recipe! It’s nice to have some savoury options too! Instead of pinning these right away, would you mind if I featured them in an upcoming post? I’m going to be publishing a savoury muffin tin recipe, and these would be very welcome additions! I’m also open to a guest post if you are interested in doing one. super idea! I knew there was a reason I went on a muffin baking frenzy the other day! Thanks for sharing your mmmmuffin recipe! Pinned and tweeted! Merci beaucoup! I am looking forward to tasting those brownie bites! Hopefully this month! What a fun idea! I’m sharing my Banana-Pineapple Muffins with you, a recipe I modified from Taste of Home’s Banana-Pineapple Banana Bread. Our family loves them!